“Very well indeed. There were 353 of us. We started from the village church at 6:00pm and arrived here at the hall some time ago. Have a look at this map here on the wall. What time did the singers arrive at the hall and what was the total number of verses that they sang? I labelled the nodes from A to G, with the Church being A and the Hall being G. In the program I added extra “start” and “finish” nodes that feed into node “A” and out of node “G”. 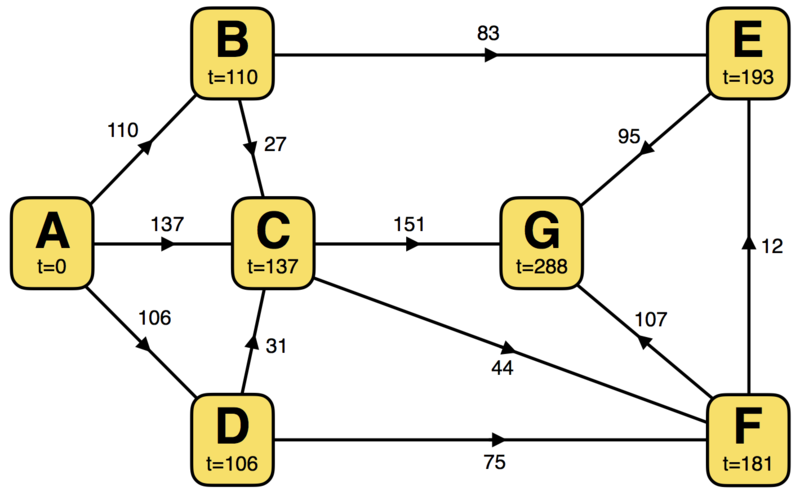 The program can then “balance” the flows of people at each node such that all arrivals/departures at each node occur at the same time, and the number of people arriving at each the node is the same as the number of people leaving that node. Starting with the earliest unprocessed node, it looks for how many people are coming towards it from earlier nodes, and then splits the number of people amongst the onward paths, ensuring the values on the paths correspond to the difference between the times for each nodes. It runs in 2.08s, so it’s not particularly fast. Solution: The singers arrived at the Hall at 10:48pm. Altogether 978 verses were sung. t=0: 353 people start at A. 106 set off towards D (arriving at t=106), 110 set off towards B (arriving at t=110), and 137 set off towards C (arriving at t=137). t=106: The A→D group arrive at D, and split into two contingents. 31 of them head towards C, and arrive at t=106+31=137, the same time that the A→C group arrive. The remaining 75 set off towards F (arriving at t=106+75=181). t=110: The A→B group arrive at B, and split into two contingents. 27 of them head towards C, and arrive at t=110+27=137, the same time that the A→C and the D→C arrive. The remaining 83 set off towards E (arriving at t=110+83=193). t=137: The 137 strong A→C group arrive at C, at the same time the 31 strong D→C group arrive and the 27 strong B→C group, making 195 people arriving at C at t=137. They split into two contingents, 44 of them head towards F (arriving at t=137+44=181) and the remaining 151 head for G (arriving at t=137+151=288). t=181: The 44 strong C→F group arrive at F, at the same time the 75 string D→F group arrive, making a total of 119 people arriving at F. They then split into two contingents, 12 of them head towards E (arriving at t=181+12=193) and the remaining 107 head for G (arriving at t=181+107=288). t=193: The 83 strong B→E group arrive at E, at the same time the 12 strong F→E group arrive. All 95 then head for G (arriving at t=193+95=188). t=288: The 151 strong C→G group arrive at G, at the same time the 107 strong F→G group arrive, as do the 95 strong E→G group, making all 353 people arriving at G at t=288, which is 4h48m after leaving A. The start time at A was 6:00pm, so the arrival time at G is 10:48pm. Here is a formulation of the problem as a MiniZinc model. Of the solvers I have available I found the [[ mzn-chuffed -a ]] solver gave the best run time (214ms), and the [[ mzn-g12fd -a ]] was the slowest with 2.88s. @Brian: That’s a neat approach. Did you do some analysis to determine the direction of the flows (other than the flows out of the church and into the hall)? Because if not I think some of them could be negative, and if you guess the wrong direction then you need to sum the absolute values of the 12 flows to get the correct answer. This Python 3.6 program runs in 228ms. I expressed the flows in lexicographical order, so the C→D and E→F flows are negative, but the sum takes the absolute values, so gets the correct answer for the total path sum. My python solution above is a translation of my manual solution in which I had already made sure that all the directions make the flows positive. But I agree it would be better to allow for negative flows by taking absolute values.